Fast-growing evergreen Irish Moss forms a dense mat of cushiony green to surround stepping stones or fill in cracks and crevices in rock gardens. 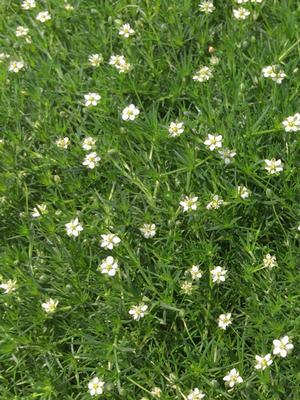 At 1”, it even sports a mass of tiny fragrant white flowers in May-June. Give it ample moisture to grow in the sun, but it prefers bright shade. Soft enough for a Leprechaun to rest on.